In an effort to address the opioid epidemic, a majority of states have recently passed some version of a Naloxone Access Law (NAL) and/or a Good Samaritan Law (GSL). NALs allow lay persons to administer naloxone, which temporarily counteracts the effects of an opioid overdose; GSLs provide immunity from prosecution for drug possession to anyone who seeks medical assistance in the event of a drug overdose. This study is the first to examine the effect of these laws on opioid-related deaths. Using data from the National Vital Statistics System multiple cause-of-death mortality files for the period 1999-2014, we find that the adoption of a NAL is associated with a 9 to 11 percent reduction in opioid-related deaths. The estimated effect of GLSs on opioid-related deaths is of comparable magnitude, but not statistically significant at conventional levels. Finally, we find that neither NALs nor GSLs increase the recreational use of prescription painkillers. Permission to link to full paper being sought from copyright holders: Copyright © by Rees, Daniel I., Sabia, Joseph J., Argys, Laura M., Latshaw, Joshua, Dhaval, Dave. (2017). Abstract from: With a little help from my friends: the effects of naloxone access and good Samaritan laws on opioid-related deaths. NBER Working Paper Series. Working Paper 23171 http://www.nber.org/papers/w23171. What does it do? When someone is overdosing, the painkiller or heroin is slowing down their heart and breathing. Naloxone temporarily stops this. Because the help is only temporary it is very important to call 911 right away! Many painkillers last longer than the naloxone so the person could go back into an overdose. Nalxone will only reverse the effects of an opioid (painkiller or heroin), not “benzos”, alcohol, meth or other drugs. Finally, it is important to also do rescue breathing to avoid brain damage from lack of oxygen. Why is it important? Someone dies of an opioid overdose every 20 minutes in our country. Both prescription opioid painkillers and heroin can cause an accidental overdose. 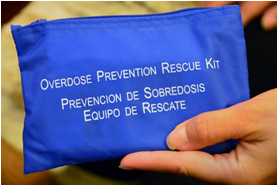 Naloxone can reverse the overdose. It’s like having a fire extinguisher ready at home if you have things that could catch on fire. Naloxone is sold in different ways – nose sprays, needle injection and automatic injection. How do I get it? Anyone who prescribes pain medication can also prescribe naloxone. Any primary care provider can prescribe it as well. In Oregon it’s legal for a pharmacist to directly prescribe naloxone to anyone. Not all pharmacies are ready to do this, though some have made commitments to. It’s a good idea to call the pharmacy first. Is it hard to use? It can be given up the nose. The Oregon Heath Authority’s 8 minute training video https://www.youtube.com/watch?v=FZpgjRBby_M helps most people feel they could give naloxone. People who overdose cannot give naloxone to themselves: a person who may see the overdose must know where it is and how to give it. You must call 911 immediately. Rescue breathing is strongly advised. Everyone should know where the naloxone is kept. Are there side effects? Naloxone causes withdrawal symptoms in the person who has overdosed. The most important one is that they start breathing again. Sometimes victims are angry when they wake up. Are addicts more likely to use opioids if naloxone is available to them? The opposite seems to be the case. Withdrawal is very unpleasant. The high and the resources it took to get it are gone. Which of my chronic opiate patient’s needs naloxone? There is no safe dose of an opioid. It would be appropriate for anyone to whom you prescribe an opioid. For example, the rate at which toddlers have been hospitalized for opiate poisoning has tripled in the last 15 years (JAMA Pediatrics). lives in a remote area or who has difficulty accessing medical care. How do I talk with my patient about getting naloxone? One way is to explain that while you intend the opioids you prescribe to improve the quality of their life, these same medicines can also take their life. Because you care very much, you are going to prescribe naloxone and make sure they know how to use it. Others have observed that “overdose” has negative connotations and prescription opioid users may not relate to it. Other terms are “bad reaction”, “accidental overdose” or “opioid safety”. Your openness is likely to increase the trust your patient places in you and improve communication. Dispense naloxone 1 g/1 ml, total 4 ml, to be used with nasal atomizer. Sig: “Give 1 mL in one nostril and 1 mL in the other nostril in the event of an overdose. Narcan (naloxone) nasal spray, 4 mg in 0.1 ml, two devices. Sig: Spray entire contents of one device in one nostril in the event of an overdose. Spray second dose in one nostril if breathing is not restored in 3 min. CALL 911 immediately if used. Rescue breathing required. Prescribe the form covered by their insurance. Rogue Valley CCOs cover BOTH the pre-filled syringe and Narcan nasal spray. Medicare Part D plans have been covering Naloxone but co-pays vary. Rogue Valley CCOs are covering the injectable vial (for IM administration), the injectable pre-filled syringe (for nasal administration) and some cover the Narcan nasal spray. What about the atomizer? 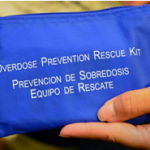 Is patient insurance in the Rogue Valley covering naloxone? The atomizer has a complex billing structure. Jackson Care Connect and AllCare have chosen to make the atomizers available to people getting naloxone. Some pharmacies charge a co-pay for it of about $5 if the patient is not a CCO member. Can someone besides me train my patients? Yes, you may delegate. Under state law Naloxone training needs to be done under the supervision of a physician or a certified nurse practioner. It is best if the patient brings someone with them who is likely to witness them overdose because that person will be administering the Naloxone. Will my insurance cover it? So far in the Rogue Valley the insurance plans contacted do cover it. The co-pay varies from zero (Oregon Health Plan) to over half the cost. Any prescriber can give you a prescription for naloxone. If you are in addiction treatment, ask your counselors. An Oregon pharmacist can legally both prescribe and dispense naloxone to you. Call them first to make sure that particular pharmacy is ready to do that. These pharmacies are helping customers get naloxone: Shady Cove Pharmacy; Safeway Pharmacy on Center Drive in Medford; West Main Pharmacy, Medford; Ashland Drug and Ashland BiMart pharmacy; Grants Pass Pharmacy; Safeway Pharmacy on 7th St in Grants Pass; Walgreen’s Union Ave, Grants Pass; Siskiyou Community Health Center pharmacies in Grants Pass and Cave Junction. Go to a public meeting organized by Max’s Mission. If you are having trouble getting naloxone, write to naloxone@oregonpainguidance.org to ask for help. Be sure to sign up for insurance if you are able to do so. Can I give it to myself? No, if you need naloxone you will not be awake enough to use it. Its effects do not last very long and should NOT be used so you can take more opioids.